As you step outside every morning, you may be amazed at the number of beautiful and bright colors that surround you daily — the bright green of the grass, the deep brown of the bark, the vibrant orange of the monarch butterfly that flies overhead, the deep blue of the sky, and the glowing yellow of the skin. There are so many stunning and eye-catching colors in this world, and yet, most people choose beige when they choose a paint color for their home’s interior. While beige is a perfectly fine color, it is overused in homes. How many homes have you walked into only to see the same old beige walls that are only a shade or so different than your own walls? Have you ever seen beige walls and thought “Wow, what a beautiful and unique color”? No, the answer is no. While you may not be the type to get wild with your colors, it is okay to branch out from beige and give your home a splash of something different. Your painting experts at JC Toland Painting can help you get a beautiful and unique look for your home, whether you want a color that will stand out or you want a decorative painting style, we can help! In this blog, we are going to go over some of the reasons why you should step away from the beige and try something completely different in your home. Read on for inspiration and reasons to ditch the beige! We get it, some people are just not bold enough to paint their walls a bright blue or green. If you want to keep it neutral, there are different browns that you can use that are better than the sandy beige color we see so often. Think deep chocolate brown that gives your home a warm and calming feel. Or maybe you want a brown that has a yellow tint to it, like a dark mustard color. There is an endless option of brown paint colors that could make your room bold and eye-catching, while still remaining neutral. As we mentioned above, beige is too common. Every single house you walk into, you will find at least one beige room. We are all unique people, have unique tastes, and we have unique styles. So, why do we all end up with the same paint color? If you want your home to stand out compared to your neighbors’ homes choosing anything besides beige is a good start. Have your guests be amazed at the different and bold look your home has compared to everyone else’s home. Beige will not have this effect, your friends and neighbors will likely not even notice your walls when they are covered in the boring beige color. Some people avoid adding colorful colors to their walls because they think it will look tacky or childish. But there are ways to add color without it being over the top. First of all, stay away from bright colors. You can still go with bold and deep colors, for example, pick a forest green over a lime green. This will give you a beautiful, colorful room without being tacky looking. These deep and dramatic colors can add a sense of sophistication and charm to your home that beige simply won’t bring to the table. These colors can be elegant on your walls, while being anything but boring. You work hard to be original and make everything match your personality and style. From your clothing choices to your home decor, your style is in everything. So, why not have your home match your personal style too? 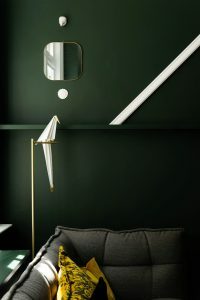 Adding color to your walls is a simple way to show what you like, what your style is, and that you are a unique individual. Colors can add personality to your home and create a different feel depending on the color. If you want your home to match your style more, paint the walls! The best part about paint is that you can easily change it to a different color if you do not like the one you choose. And with JC Toland Painting paint removal service, we can make sure you get rid of a color you don’t like and your walls get painted with your next choice of color. Paint is not 100 percent permanent, and if you try a color that is awesome for a few months, but then gets old, you can change it to a different color. Why not try a color that you might love? You really just might end up loving it and it will give your home a different look and feel. There are many reasons to ditch beige and try a new and dramatic paint color in your home. If you are sick of the old boring color in your home, contact JC Toland Painting! We can help you find a new color and style for your home.